What: Shares of teen-focused clothing retailer Abercrombie & Fitch (NYSE:ANF) fell 15.3% in April, according to S&P Global Market Intelligence data, as investors gave back some of the gains the company has produced after the ouster of former CEO Mike Jeffries. So what: April represented a change of fortunes for Abercrombie. In March the company continued its strong one-year performance, up 21%, by adding 7.5% to its gains. The impetus for Abercrombie's returns was a solid fourth-quarter report that saw the company beat consensus analyst expectations on both revenue and earnings per share. Investors were particularly encouraged by Abercrombie's positive year-on-year comparable-sales growth, its first year-on-year growth in more than three years. 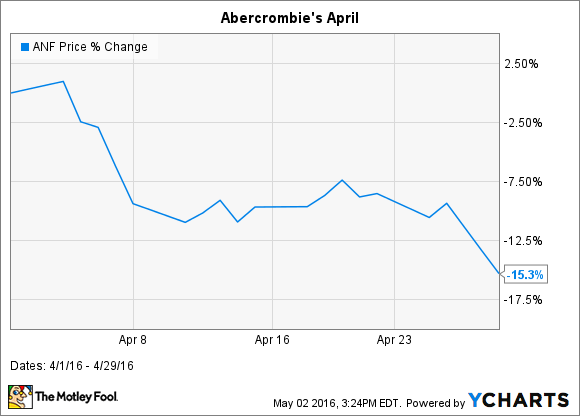 For April, it seems secular headwinds dragged down Abercrombie & Fitch's returns. Abercrombie's competitors American Eagle Outfitters, The Buckle, and Express Inc. also endured a rough month, with losses of 14.2%, 14.6%, and 15.1%, respectively, during the month. Sector valuations were further compressed when speculation of Aeropostale's expected Chapter 11 bankruptcy came to light later in the month. Now what: Comparable growth was led by Abercrombie's Hollister brand, which grew 4% and offset the larger Abercrombie brand's decrease of 2%. For full-year 2016 the company expects "flat to slightly positive comparable sales." Investors should look toward Hollister for future growth. More broadly, Abercrombie is facing changing consumer preferences away from brands and labels. In 2014, Abercrombie started to sell non-logoed apparel to accommodate the demands of millennial shoppers. The issue with selling non-descript clothing is it becomes harder to monetize your brand name. As such, the brand and logo monetization strategy that Abercrombie has been so adept at has now given way to a trend-focused market where teens want the newest style faster than their peers. Fast-fashion company Zara, created by the second richest man in the world, Amancio Ortega, has thrived in this environment by bringing affordable runway-inspired fashion to market in a matter of days. It's unlikely Abercrombie & Fitch will be able to compare with Zara or H&M in the short term. Abercrombie & Fitch faces a difficult market, but flat comparable guidance is a step in the right direction in an environment where peers are declaring bankruptcy.